Edible Edinburgh chairperson Councillor Lesley Hinds and Green Pencil Award winner Louis Reilly. Earlier this year primary school children from across Edinburgh submitted their entries for the Green Pencil Award 2015, on the theme of ‘Food for Thought – Scotland’s food and drink’. 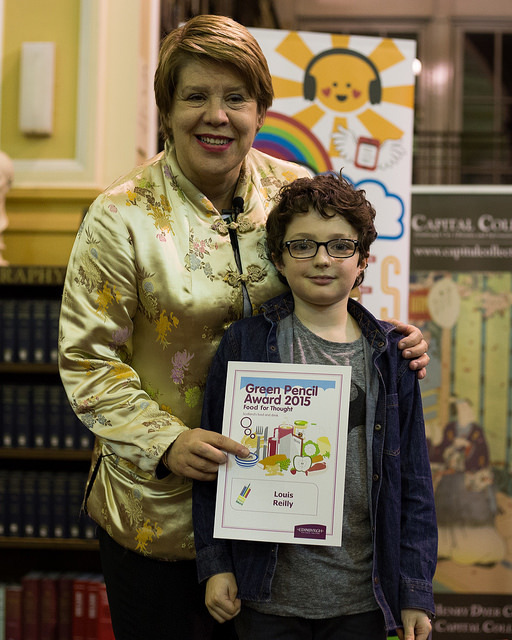 You can take a look at some of the wonderful shortlisted entries in the published competition brochure, see photos from the results announcement ceremony or read about the overall winner, Louis Reilly and his entry ‘What they say…’. Edible Edinburgh was proud to support the competition with a donation of Scotmid Fairtrade vouchers. Well done to everyone who took part!